With a diverse set of sheetfed offset lithographic presses operated by press operators and electronic prepress personnel who share a total of over 180 years serving the University of Minnesota, Printing Services offers award-winning print production for long runs that require the highest print quality. High-quality digital printing is available at five convenient Digital Print Center locations across campus. Drop your file off in person or place your order online. Free on-campus delivery is available for all orders. Variable data printing (VDP) combines the power of your database with the effectiveness of Printing Services’ variable technologies and high-quality digital printing to successfully connect with prospective students, alumni, donors, and key stakeholders. Printing Services offers high quality 600 dpi large-format printing at exceptional prices. Our large-format inkjet printers produce brilliant, accurate colors that are sure to enhance any event. Posters and banners are available up to 58” wide by any length. You can also have your poster laminated and mounted to foam core or Sintra for a professional, effective finished piece. Thesis printing is available on 100% cotton rag content paper for durability and permanency or a high quality acid-free paper. Traditional thesis binding includes a custom made hard cover using the Buckram fabric color of your choice and a foil-stamped spine with your name, degree, and the year. Precision is the focus of the Printing Services’ bindery department. From sharp folds to perfectly aligned images and accurate trims, the bindery is watching the fine details in finishing. Capabilities include the basics such as folding, cutting, and drilling as well as more extensive services such as scoring, perforating, numbering, laminating, booklet-making, and a wide variety of binding options. We are also staffed to handle gluing, hand collating, and other assembly processes. At Printing Services, mailing your piece is a simple extension of the printing process. We partner with Addressing & Mailing Services and work closely with them to successfully and economically complete the production process. Addressing & Mailing provides a comprehensive mail operation, capable of managing your mail list, inserting, addressing, and sorting for rapid delivery. Addressing & Mailing also provides free consulting services. Their expert staff Understand the University of Minnesota and work closely with you to obtain any available mailing discounts. Visit the Addressing & Mailing website to learn more about mailing your printed piece. Printing Services proudly boasts a reputation as a leader in high-quality printing. The recent addition of the latest in printing technology, combined with a team of knowledgeable, experienced prepress operators, press operators, and bindery staff has led to Printing Services being recognized with several distinguished printing awards. At Printing Services, we’re proud to offer colleges and departments at the University quality printing that competes with the best commercial printers in the United States. Printing Services has won numerous national awards in the In-Print competition, co-sponsored by International Publishing Management Association and IN-PLANT GRAPHICS magazine. These awards recognize and promote the educational and corporate publishing industry for excellence in printing. 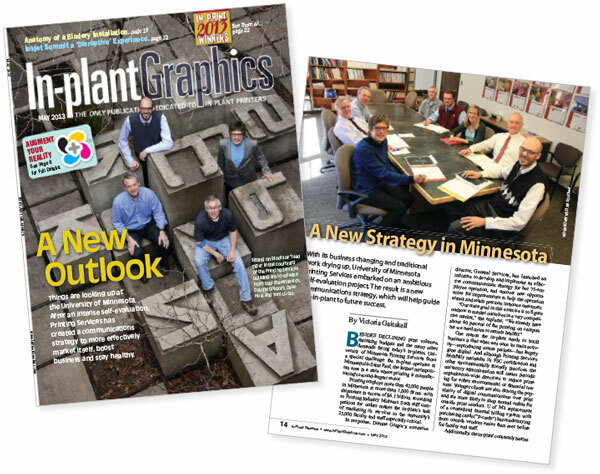 Fresh off a “Best In Show” performance in last year’s In-Plant Printing and Mailing Association (IPMA) national “In-Print Contest” and an additional three Gold Awards this year, In-Plant Graphics Magazine contacted Printing Services to find out what was behind the recent success. The resulting discussions led to a feature article in the May 2013 issue of the magazine. The article, titled “A New Strategy in Minnesota”, highlights the steps Printing Services has taken to specifically define our role within the University and to develop a positioning statement that guides our service improvement plans, our future business decisions, our marketing communications, and our process of creating a customer-focused user experience that supports the mission of the University. We’re proud to be recognized as an industry leader for our dedication to quality and our commitment to supporting the University of Minnesota.